In a move aimed at development, launch and delivery of products and services, ADESA named Kurt Madvig vice president of product development. Madvig joined parent company KAR Auction Services in 2001 as an auction general manager to establish and develop ADESA Long Island in New York. Soon after the launch of the Long Island location, Madvig joined ADESA San Diego, and the company noted that he achieved double-digit revenue growth there. He starts in his new role with 30 years of automotive remarketing industry experience. He most recently served as vice president of auction operations for ADESA, where he took a leadership role in opening of ADESA’s Chicago location, according to the company. An active member of the National Auto Auction Association, Madvig currently serves as co-chair of the NAAA Standards Committee. ADESA also named several current employees to the product development team under Madvig’s leadership. Eddie Ammar, senior director of protection products, will oversee ADESA Assurance and the development of additional protection products. Director of inspection services Jason Murdock will be responsible for thorough inspections and creating new inspection offerings. Senior project manager Colleen McCormick-Shankle will oversee new product launches and implementations. Auction accidents happen, especially when vehicles are driven through the lanes. To minimize the chances of vehicle accidents, ADESA has established what it calls VirtuaLane at 20 of its 75 physical auctions in the North America. A VirtuaLane sale has all the trappings of typical physical auction lanes: an auctioneer, ring men and dealers bidding in-lane and online via ADESA LiveBlock. But no vehicles are driven across the block. Instead, VirtuaLane vehicles appear in photos, along with their condition reports, on big screen monitors in an auction lane. The vehicles are on-site, reconditioned, clean, lined-up in sale order and available for tire-kicking. Peter Kelly, president of ADESA’s parent, KAR Auction Services, and John Hammer, president of ADESA, during separate interviews at Used Car Week in November, said VirtuaLane grew out of consignors concerns about safety. In mid-February, ADESA provided updates about VirtuaLane which evolved from a pilot program last fall to another option for its customers to buy and sell vehicles at it auctions. It was officially announced by the company this week. “By partnering with major automotive brands such as American Honda Finance Corp. and others, we have successfully launched VirtuaLane – a modernized, safe, in-lane auction experience,” added Hammer, in a press release Monday. Not all lanes and not all sellers at a given ADESA auction site participate in VirtuaLane sales, and its primary customers are captive finance companies, Hammer said. Kelly said consignors that want to explore VirtuaLane sales also want to determine if they can achieve the same business outcomes and dealer satisfaction without the vehicles being driven during the sale. “It’s a thing we’ve certainly been asking for many years,” said Kelly who took on his current title in January. He was president of KAR’s digital services and its chief technology officer during the November interview. In 2017, KAR Auction sold 5.5 million vehicles across its business units with more than half of those vehicles sold to buyers who placed their winning bid though a desktop computer or mobile device, Kelly said. That number includes online only sales on KAR’s OPENLANE or TradeRev platforms, when the vehicle is not at a physical auction and hybrid sales such as VirtuaLane and ADESA LiveBlock when the vehicle is at an auction — either parked or in-lane — and sold to an online bidder. ADESA took a leading role in auction safety in 2015 when it agreed to share Safe T. Sam, a cartoon, super-hero-type mascot dressed in blue jeans, yellow boots and a green and white shirt, and its workplace safety training program with National Auto Auction Association-member auctions. The company is constantly trying to come up with ways to make its auctions safer for dealers and its employees, Hammer said. For example, the company added cross walks in their auctions to indicate pedestrian pathways, and installed safety bollards at several auctions to ensure cars stay in their lane during the sale. Because dealers often use their mobile phones to bid on and gather information about vehicles and other things, ADESA is testing features to warn customers when a car is moving. In one such feature, a moving vehicle triggers lights that shine on the floor as a visual warning for people who are nearby. ADESA Brasher’s, Rio Linda, Calif.
ADESA Golden Gate, Tracy, Calif.
ADESA Kansas City, Belton, Mo. ADESA Las Vegas, North Las Vegas, Nev.
ADESA Montreal, St. Eustache, Que. ADESA Nashville, Old Hickory, Tenn.
ADESA New Jersey, Manville, N.J.
ADESA Washington, D.C., Dulles, Va.
“Every day we strive to meet our customers’ evolving needs and integrate the latest technological advancements in the industry to meet their expectations,” said Trevor Henderson, ADESA Canada’s chief operating officer, in Monday's press release. But just as safety prevention measures take on many guises, so do the kinds of occurrences people need to be protected from. Larry Hero, general manager of America’s Auto Auction, said safety is the “No. 1 priority” at his company, and its main focus is making sure employees and customers at its 21 auctions sites are protected from outsiders who might deliberately harm people and/or property. Hero said customers want to bring their own service technicians and/or inspectors must introduce outside guests to auction personnel, the reason for the guests’ visits must be stated, and guests must remain in areas open to the market for that day. Auctions holding areas, their back shops and its recondition areas are strictly off limits, he said. “We’ve upgraded our camera system, we’ve upgraded our security system and we’ve upgraded our employee badges to see who walking in and out,” Hero said. During a phone conversation with Auto Remarketing, Hallett explained the basics of the TradeRev Guaranteed Trade-In Value Offer now being piloting in an undisclosed market so dealers can reach potential customers who leverage smartphone capabilities. “Basically, a consumer can download the TradeRev app, they can take pictures of the car and load them,” the KAR chairman and chief executive officer said. “Then algorithms we built will give them an instant cash offer. They can take that instant cash offer to the dealer and either get a check or use it as a trade. “The big benefit here is it creates trust and transparency for the consumer, but it also gives the dealer a lead he may have never gotten on his own,” Hallett continued. Hallett indicated it took the KAR technology team about four months to prepare the TradeRev Guaranteed Trade-In Value Offer ready for this pilot. Again, he didn’t divulge exactly where the pilot is happening, but the company has high hopes for success. 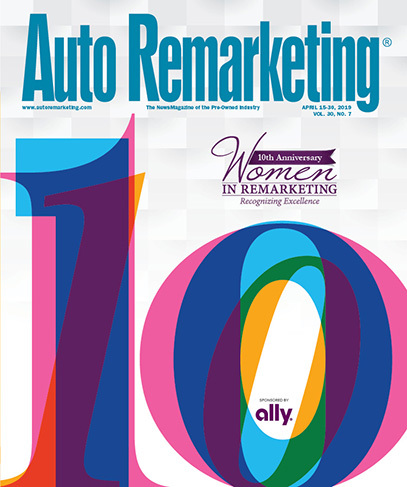 Also on the call with Auto Remarketing was KAR executive vice president and chief financial officer Eric Loughmiller, who added: “We have a situation where one of the best ways we can help a dealer is having a firm number on a trade-in. That allows the dealer to execute the transaction, or for us through TradeRev, to agree to a value on the trade-in. “If you think about what the dealers are pressured against, he’s guessing on wholesale value and closing a retail transaction. If we can eliminate one of those variables, that can improve the profitability of that dealership if he can make fewer mistaking on valuing that trade-in,” Loughmiller went on to say. Before having a conversation with Auto Remarketing, KAR hosted its quarterly conference call with investment analysts who quickly picked up a specific element contained in the company’s vast financial statement. KAR acknowledged that it incurred an operating loss of $53.0 million for the year, which was attributable to the rollout of TradeRev. In his opening comments, Hallett immediately addresses the matter. “Given the impact that TradeRev is having on our performance, let me give you more information on this important initiative for KAR,” Hallett told Wall Street watchers. “During my time at the NADA Convention in January, it was reinforced that a digital transformation is happening throughout the entire automobile marketplace. Franchise and independent dealers are investing in digital platforms. Consumers are seeking tools that make the car buying experience more efficient and more transparent. And the time to execute within the automobile ecosystem is clearly being reduced and this transformation is happening in the wholesale marketplace as well. “Clearly, dealers are looking to move trade-ins faster at the highest possible value and the TradeRev technology enables dealers to do this within hours of the retail transaction instead of days or even weeks in the past. I believe, the TradeRev platform can serve the needs of the dealers, and I’m absolutely committed to winning in this space,” he continued. Hallett then evaluated on the four-year journey KAR and TradeRev have taken so far. “First, my expectations of winning the U.S. market has not changed, but we are also finding the cost to launch TradeRev is greater than our initial expectations. I knew that an opportunity like TradeRev would attract competition and it certainly has,” Hallett said. Hallett then went on to mention what he believes are the key components of TradeRev that supported his assertions. He highlighted that revenue per TradeRev transaction is “in the neighborhood” of $250, which is similar to KAR’s other online offering. Hallett also computed that KAR can achieve gross profit of more than 75 percent on the sale of vehicles when TradeRev reaches the scale KAR is targeting. Hallett added that KAR transacted approximately 60,000 vehicles on TradeRev in 2017 and approximately 120,000 units in 2018. He expects the sales figure to top 200,000 units in 2019 as TradeRev currently operates in 128 markets in the U.S. and Canada, with the goal of being available in more than 175 markets by the end of this year. After sustaining a loss of $53 million in 2018, Hallett went on to acknowledge the loss could reach $60 million this year before receding in 2020. “And as we reach this scale in 2019, I expect losses to be reduced in 2020,” Hallett said. “And I’ve set a goal of achieving breakeven sometime in 2021. Achieving the goal of breakeven will depend on our success over the next two years in entering new markets and reaching scale in a sufficient number of markets. We will also need to see some stabilization of the market dynamics and the competitive landscape to achieve this goal. “TradeRev was initially launched in Canada, and we have markets in Canada that have demonstrated that they are profitable operations in the local market,” he continued. “And to achieve profitability, we need to reach an adequate scale with customers routinely using TradeRev as an efficiency tool for their operation. We need to increase the number of cars sold per employee in the market to achieve profitability, and our compensation programs for our field employees are aligned with this objective. Editor’s note: More details and executive comments about other segments of KAR’s 2018 performance and current standing will be contained in a future report. As TPC Management Co. (TPC) rolled out details for the next installment of Auction Academy, an operation that has sent graduates through that continuing education program recently received a top industry accolade from United Auto Credit. Officials announced registration for Auction Academy Class 6 is now open as it's scheduled for May 16-18 in Nashville, Tenn.
And showing how training can be beneficial, United Auto Credit has named Missouri Auto Auction as its 2018 Auction of the Year. “Auction Academy’s presence and exhibit booth during the 2018 NAAA/NRC Convention in Scottsdale, and the positive reviews by previous graduates and the companies they work for have generated great interest and excitement for the upcoming Class Group,” Wanna said. Auction Academy has developed two curriculums. One is a two-year program structured like an executive MBA program that provides training and development for auto auction professionals. The second is Seminar Series, which features one-day sessions covering a specific topic or functional area. The curriculum includes site visits, field trips and work with experts in all areas of auction operations. Auction Academy also announced the completion of the seventh session of Class Group 5 in Detroit and that its final session and graduation would take place at the 2019 CAR Conference in Las Vegas next month. In addition, the academy made its seminar series available to the staff at BSC America’s Bel Air Auto Auction in Belcamp, Md. “Class 5 has been the most Industry-aggressive group to-date, with both the IARA CAR Certification and Safe T. Sam Certification added to our curriculum,” Wanna said in a news release. “Our students have worked diligently to complete their certifications during and in between class sessions," she added. Class 5 will meet next during the 2019 CAR Conference in Las Vegas beginning on March 25. In addition to a tour of ADESA Las Vegas, the group’s eighth and final session will include in-class presentations by Brent Ramels of SmartAuction, Lynn Weaver of IAG, Cody Boswell of Missouri Auto Auction and Auction Academy Alumni, who will host a segment on Auctioneering 101. The group’s graduation ceremony will take place on March 27 during the conference’s awards and recognition ceremony. During the IARA portion of the ceremony, the entire class is expected to receive IARA CAR certifications. Back on Dec. 3 and 4, the academy took its workplace culture seminar to BSC America’s Bel Air Auto Auction, and the auction’s department heads and key employees attended a program focusing on sexual, physical and mental harassment, physical danger, safety and insurance. “The Nichols family has developed a strong culture of continued education, key reminders and real-time guidelines to help ensure a safe and productive work environment for their dedicated employees,” Wanna said . As mentioned, United Auto Credit awarded Missouri Auto Auction as its 2018 Auction of the Year. United Auto Credit director of loss mitigation Scott Mousaw noted in a news release that the honor stemmed from consistently performing at the highest levels in sales, services and operations. This year’s award follows Missouri Auto Auction’s designation in 2017 as a United Auto Credit regional auction of the year. Missouri AA is a member of the ServNet Auction Group. “The auction’s dedication to service shows in every step of the auction process, and by every member of the auction team who has responsibility for our vehicles,” Mousaw said. “Missouri Auto Auction has developed a robust market for United Auto Credit, and their concerted efforts on our behalf are evident in outstanding retentions and conversions throughout the year," he continued. Mousaw will present the Auction of the Year Award on site at Missouri Auto Auction in March to the auction’s general manager, Justin Brown, and the auction team. Brown said in a news release that the auction has been selling vehicles for United Auto Credit since 2010, featuring its vehicles at monthly sale events. In the fifth of six panel discussions recorded at Used Car Week 2018, Joe and Nick moderate a session on the rapid evolution of the wholesale used-car space, titled "Innovators: The Next Generation of Used Cars." Panelists include George Chamoun of ACV Auctions, Kayne Grau of KAR Auction Services, Bob McConkey of McConkey Auction Group, Brooks Stewart of Bridgecrest and Jim Williams of Cox Automotive. And stay tuned for more from Used Car Week. Columbus Fair Auto Auction has entered into a new relationship with American Honda Finance Corp. With a lane at Columbus dedicated to Honda and Acura, the relationship will kick off on Feb. 27 with 200 off-lease vehicles. In other auction news, Shelly Frank has joined Dealers Auto Auction of the Rockies & Dealers Auto Auction of the Southwest as their director of national accounts. At 9:30 a.m. on Feb. 27, more than 200 Honda and Acura vehicles will run in Lane 2 at Columbus Fair. In Lane 1, the auction will feature units from local Honda dealers including Roush Honda, Lindsay Honda, Hugh White Honda, Germain Honda and others. In terms of the Dealers Auto Auction personnel news, Frank will serve the Colorado and Arizona markets for DAA Rockies and DAA Southwest. Frank’s more than 25 years of auction arena experience includes 12 years working in business development and operations and more than 15 years on the finance side, managing repossession and remarketing processes for finance companies. Frank most recently worked on the West Coast as business development manager for Auction Management Solutions, working with company president Tom Stewart. KAR Auction Services chief economist Tom Kontos applauded the strategy used by commercial consignors after reviewing January wholesale price information. According to ADESA Analytical Services’ monthly analysis of wholesale used vehicle prices by vehicle model class, wholesale used-vehicle prices in January averaged $10,761, representing a 1.3 percent rise compared to December but a 2.0-percent dip relative to January of last year. Kontos pointed out that prices for all segments other than compact SUV/CUVs and compact pickups softened on a year-over-year basis. Average wholesale prices in January fell on a year-over-year basis for the third month in a row, though they were up seasonally,” Kontos said in his latest installment of the Kontos Kommentary distributed late on Thursday. “Auction prices for off-lease units were again a major bright spot, as upstream remarketing continues to be effective in distributing supply across multiple channels,” he continued. According to ADESA data for January, prices for fleet/lease consignors rose 1.9 percent sequentially and 3.9 percent annually. Along with elaborating about the wholesale scene in this online video, Kontos also shared his monthly look at vehicles that often become certified pre-owned inventory — 3-year-old midsize cars and SUV/CUVs with less than 45,000 miles. When holding constant for sale type, model-year age, mileage, and model class segment — using criteria that characterize off-lease units — Kontos stated prices were up significantly on a year-over-year basis. For midsize cars, prices jumped 3.5 percent or $401 to $11,867 while prices for midsize SUV/CUVs rose $107 or 0.5 percent to $20,308. Kontos added incoming supply has been skewed toward trucks which kept prices for those fleet/leases units for climbing more. And with many portions of the country encountering frigid temperatures during the opening month of the year, Kontos said, “Retail sales were affected by severe weather conditions,” while noting that January CPO sales dropped 10.9 percent from the prior month and 1.8 percent year-over-year, according to figures from Autodata Corp.
Rounding out the latest monthly update, Kontos indicated that average wholesale prices for used vehicles remarketed by manufacturers in January slid 2.6 percent month-over-month and 2.9 percent year-over-year. And the ADESA information for January revealed average prices for dealer consignors dipped 1.6 percent versus December and 2.1 percent relative to January of last year.